● How do I delete a screenshot or screen? 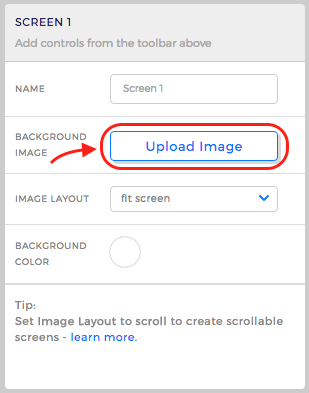 If you want to delete the entire screen containing that screenshot, click the 3-dots-icon on the top-right corner of the screen thumbnail and select Delete. ● How do I copy a screenshot or screen? 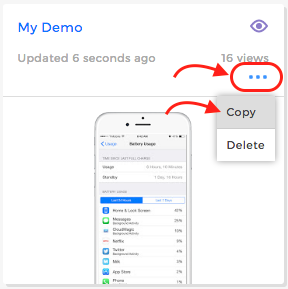 To create a copy of a screen, click the 3-dots-icon on the top-right corner of the screen thumbnail and select Copy. ● Can I replace a screenshot while keeping all the elements on the screen? Yes. Select the demo screen in edit mode then click the button Upload Image in the Properties panel on the right-hand side and upload the new screenshot. The old screenshot will be replaced with the new one, while keeping all the elements in place. ● Can I create small animations such as loading effects? ● With the Timer control: just upload the frames of the loading effect as different screenshots and add a Timer control on each of them. The Timer will make the demo advance through the screenshots automatically, creating the loading effect. ● Can I accept values from users that are passed through the demo? Yes. Use the User Input control. More details in this article. ● Can I create scrolling screens? Yes. Please find more details in this article. ● Can I add audio/voice to the demo? Yes. You can use our cool Text2Speech function or upload your own audio files. Please find more details in this article. ● Can I add video to the demo? Yes. You can either embed a YouTube video or play a video file stored on a server. More details in this article. ● How do I delete a demo? 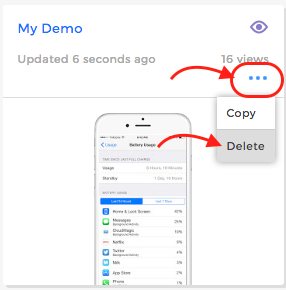 Go to My Demos page and click the 3-dots-menu in the demo box, then select Delete. ● Can I clone a demo so that I can use the same screenshots? Yes. Go to My Demos page, click the 3-dots-menu in the demo box, then select Copy. This will create a copy of the demo, that you can modify while keeping the original demo untouched. ● Is the number of views from the demo page counting also my views? Yes. That's why your demo counts some views even if it is private. 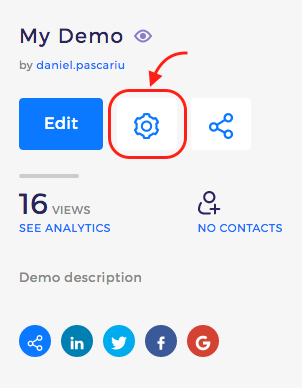 ● Can I get statistics about the clicks that demo visitors make in my demos? Yes. The Analytics report called Interaction Flow will show you the navigation paths that users take in your demo. You can read more about the Analytics functionality in this article. ● Can I get users contact details with the demo? Yes. You can capture leads and receive feedback from your users using a Contact Form. Please read this article. 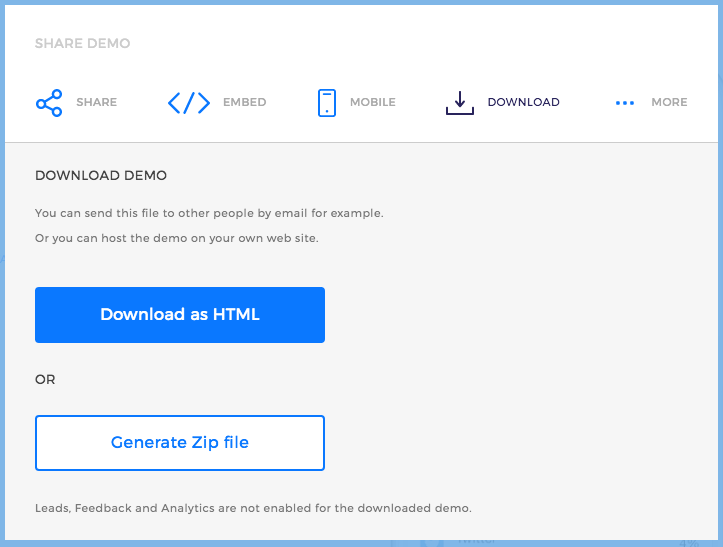 ● How do I embed the demo in a web page or blog post? 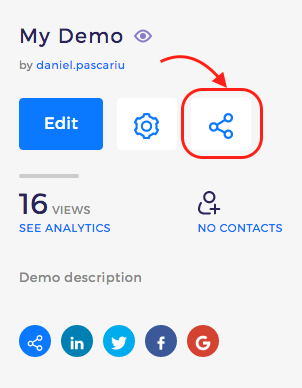 On the Demo Page click the Share icon. 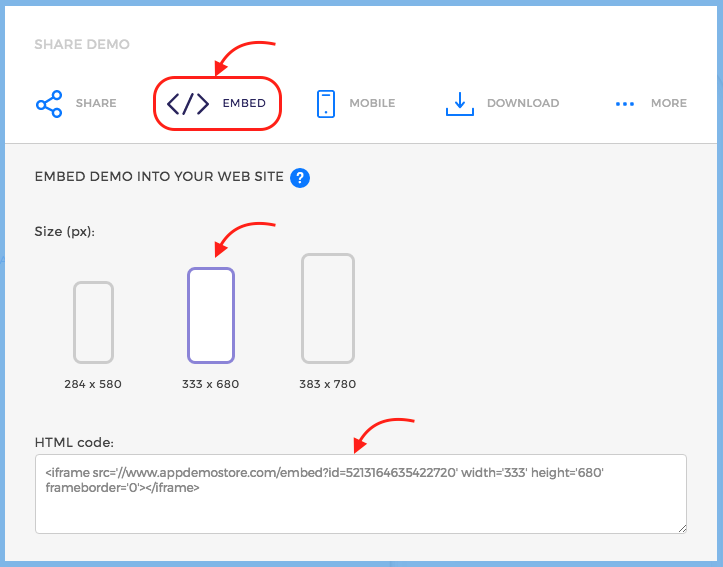 Than in the Share pop-up window, go to Embed tab and copy the embed code provided there. Paste it into your web page or blog post. ● How do I add the demo on my smartphone or tablet? You can install your demo on your iOS and Android devices. Please read this article. ● Can I download the demos on my computer and delete them from the cloud? Yes. To download your demo go to the Demo Page and click the Share icon. In the Share pop-up window go to Download and download you demo file as HTML or ZIP. After downloading your demo you can delete it from our platform. However, we advise you to keep it because you will not be able to upload it back in case you need to modify it in the future. ● Can I print a storyboard of my demo? Yes. You can print a PDF document with all the screens in your demo. Have a look at this article. 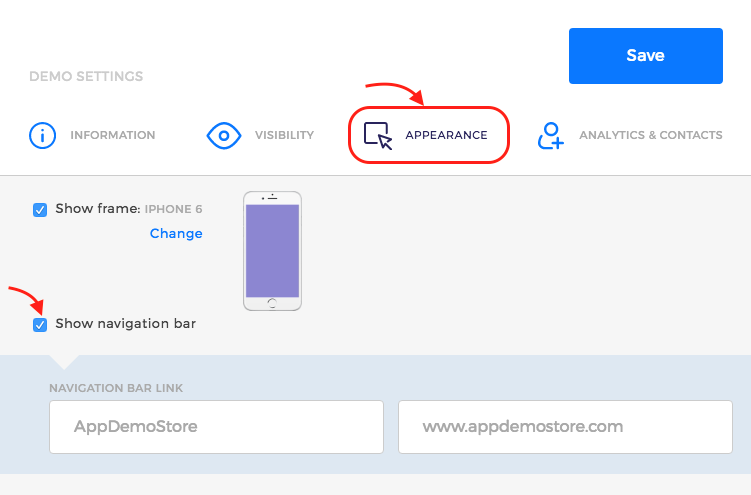 ● How can I use the demo created on AppDemoStore.com platform to promote my app? ● Can I change the device frame of a demo while keeping the link in place? Yes. Go to the Demo Page, click the Settings icon and go to the Appearance tab. Click the Change link next to the device frame. ● Can I make the demo run automatically? Yes, by using the autoplay option. Go to the Demo Page, click the Settings icon and go to the Appearance tab. Select the checkbox next to the Enable autoplay option. 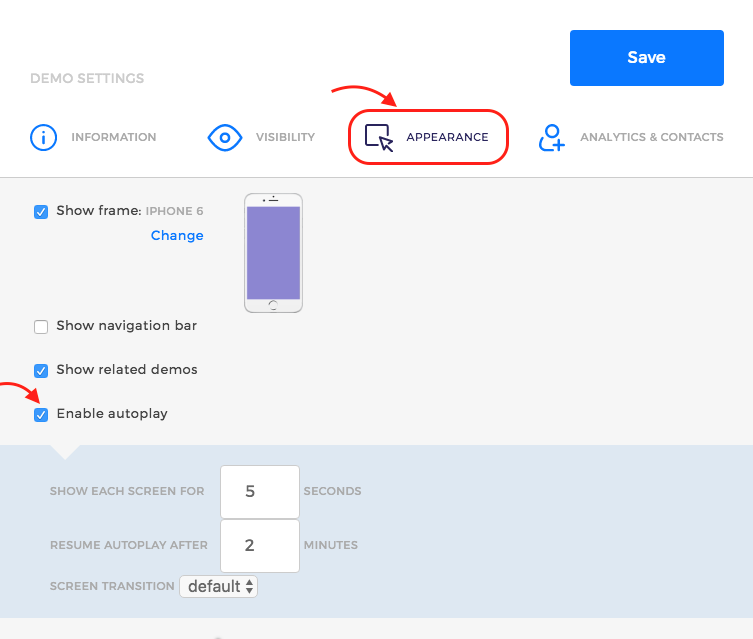 Using the autoplay settings you can configure its behaviour (time per screen, transition type and resume autoplay time). 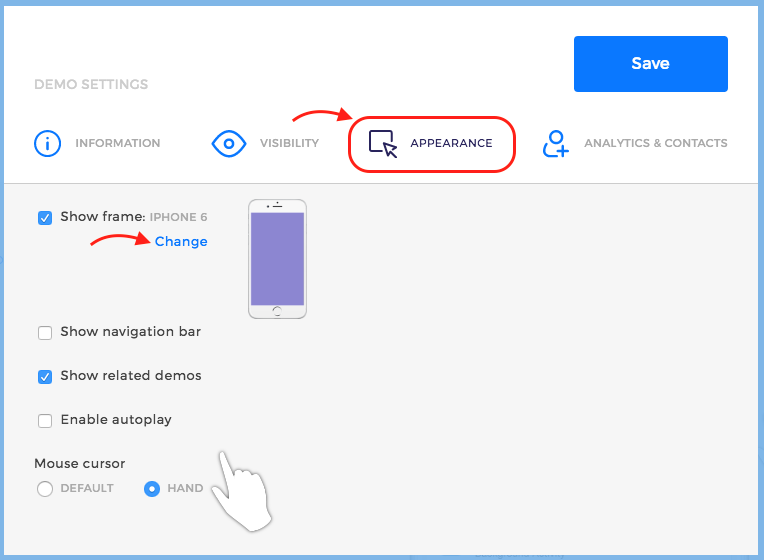 The autoplay mode stops when the users interact with the demo so that they can click through it and starts again after 2 minutes (this time can be changed in the autoplay settings). ● Can I share the demo only with a limited audience? 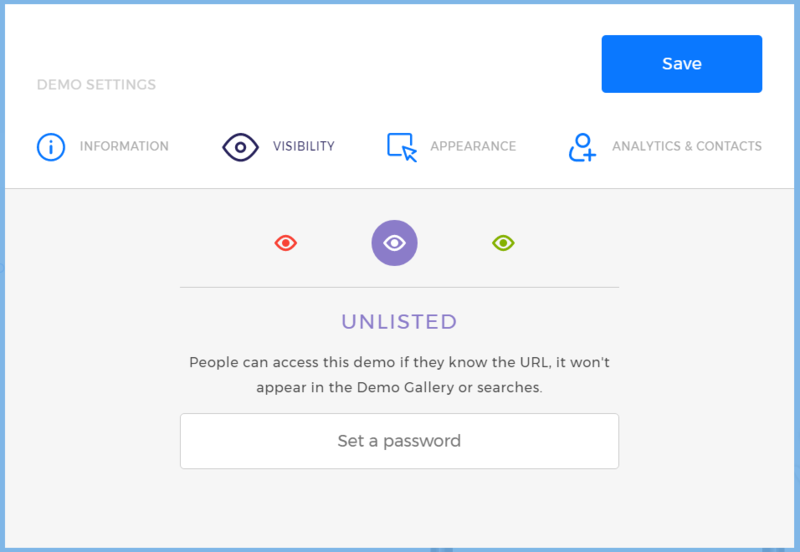 Yes, by setting the demo Visibility to Unlisted. To do this go to the Demo Page, click the Setting icon. In the pop-up window go to the Visibility tab and select Unlisted. An unlisted demo will not be listed in searches or in the gallery, but will be accessible via the link. Moreover, you can set up a password for it. ● Can I hide the demo navigation toolbar or configure it? Yes. Go to the Demo Page, click the Settings icon and go to the Appearance tab. Unselect the checkbox next to the Show navigation bar option to hide it. Or you can use the options to replace AppDemoStore with your company name. ● What does "10 demos" for the Silver account mean? You can have up to 10 demos in your account. When your account reaches the 10 demos limit, you will not be able to create new ones unless you delete some demos. ● Can I change plans any time? ● Can I cancel my subscription any time? ● What happens after the Trial period ends? After the trial period ends you have to upgrade to one of the paid plans to be able to use the tool. If you choose not to upgrade, your account will be switched to Basic, your demos will be made private and you will not be able to edit demos or create new ones. ● What's the difference between Silver and Gold? We use trusted partners like PayPal and Braintree Payments to process all payments. We don't store your credit card information on our servers. Once a payment has been completed you'll find your invoice on your Account page under the Billing tab. By default you get a simple receipt - in order to get an invoice you need to maintain your company information under the Billing Details section. ● How secure is this?